The outer case and front cover of the first edition "Four Fabulous Faces"
Above: The now infamous missing page which Joan extracted from her copies of the book. 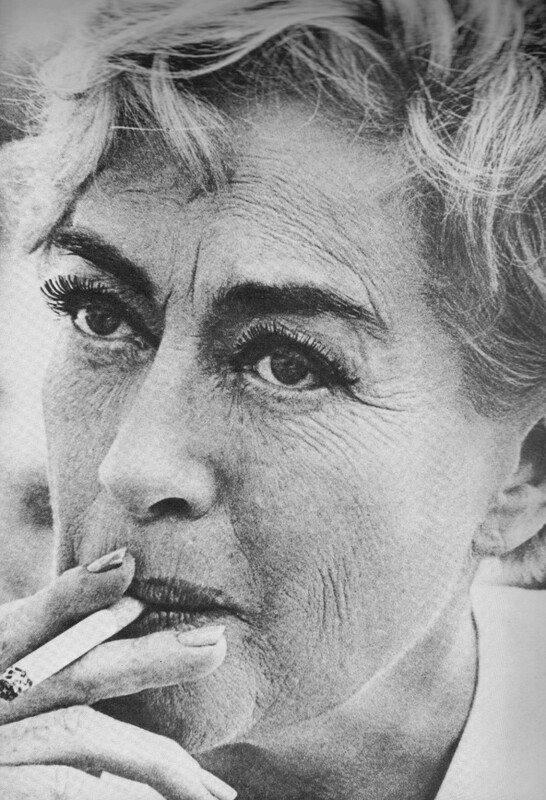 ​The page was a full-page photo of Joan on the set of "Trog" in July 1969. 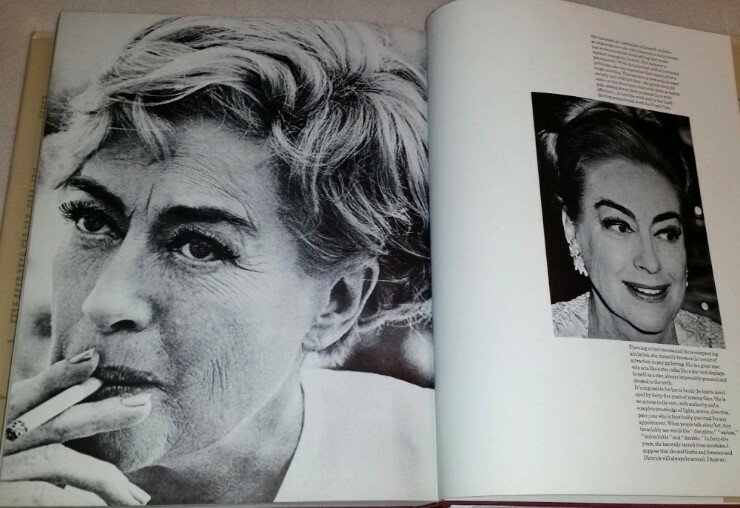 Above: The page with the 1969 photo as it appears in an intact copy of the first edition of "Four Fabulous Faces". 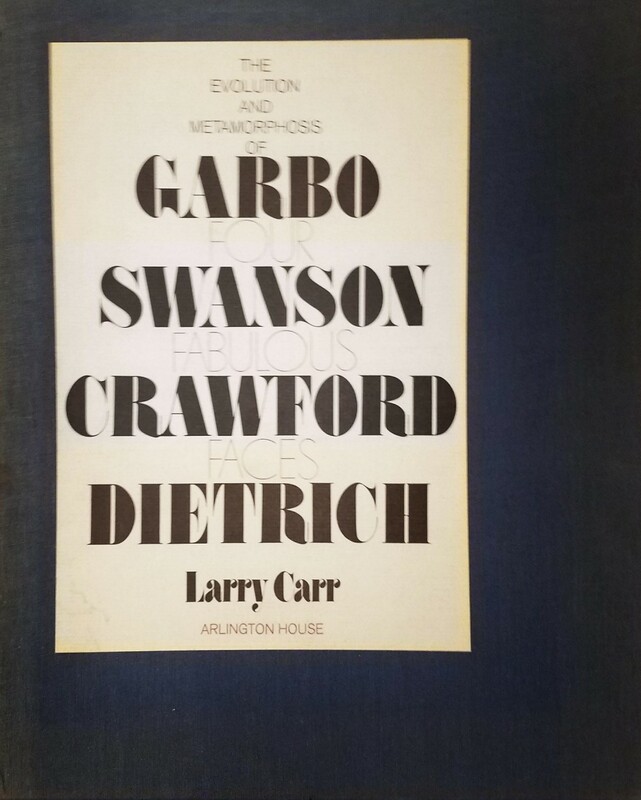 ​​ “She turned to me and said, in plumy tones, “Carl, dear, do you have a copy of Four Fabulous Faces?” She was referring to Larry Carr’s huge coffee-table book of photographs of Garbo, Swanson, Dietrich, and herself, which had been published a couple of years before. “Would you like my copy?” she smiled sweetly. “Now don’t be silly; I can always get another,” she interrupted. And then called, “Mamacita! Bring me my black Pentel pen! I had been suitably rewarded for a job well done, and it didn’t matter when I found out later that she had, of course, a whole closet full of Four fabulous Faces. She had made me feel special, and that’s what counted. 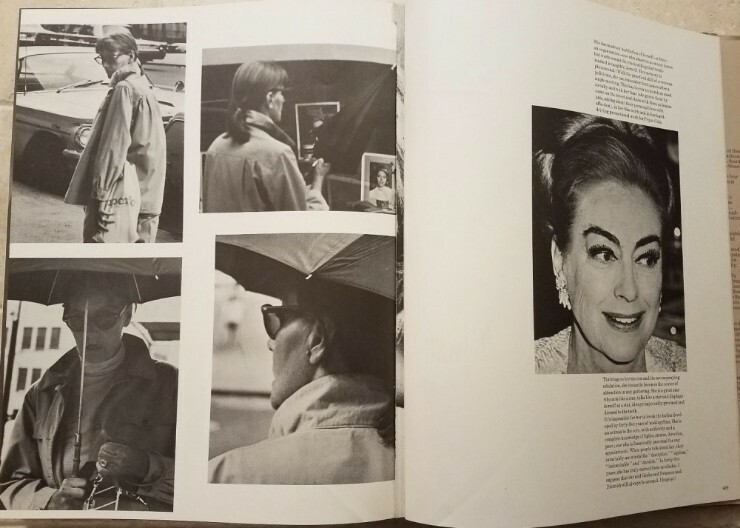 It wasn’t until well after her death that a mutual friend, while paging through that book in my living room, pointed out to me that Joan had carefully excised a candid photo of herself which first accompanied a New York Times interview. It’s actually a marvelous picture of her, puffing away at a cigarette, her hair casually tousled, and an expression on her face that is at once both tough and tender. 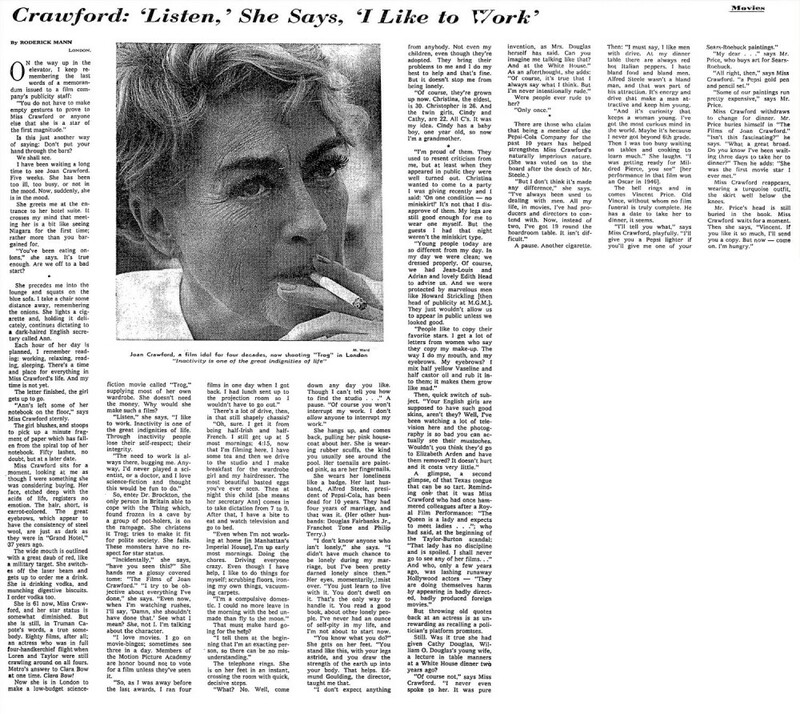 But it shows every wrinkle, and even a few freckles, and Crawford was still hell-bent on selling glamour, so she simply tore it out of each and every one of her own copies of Four Fabulous Faces, The image was everything." “Joan became good friends with her neighbors in Imperial House, Curtis and Anne Anderson, and Selma and Marty Mertz. Joan often called Anne Anderson to come over to her apartment for advice on cooking, but often she seemed to call out of loneliness. Anne and Curtis Anderson were surprised by the request from Joan. She had been invited to a dinner party that evening at their apartment. When they arrived at 22H, they were shocked to see Joan with an eye swollen shut as though from a beating. “I don’t know,” she said. “I was sitting at the table writing notes and I must have blacked out. The next thing I knew, I was on the floor, and I must have hit my eye on the edge of the table in falling. 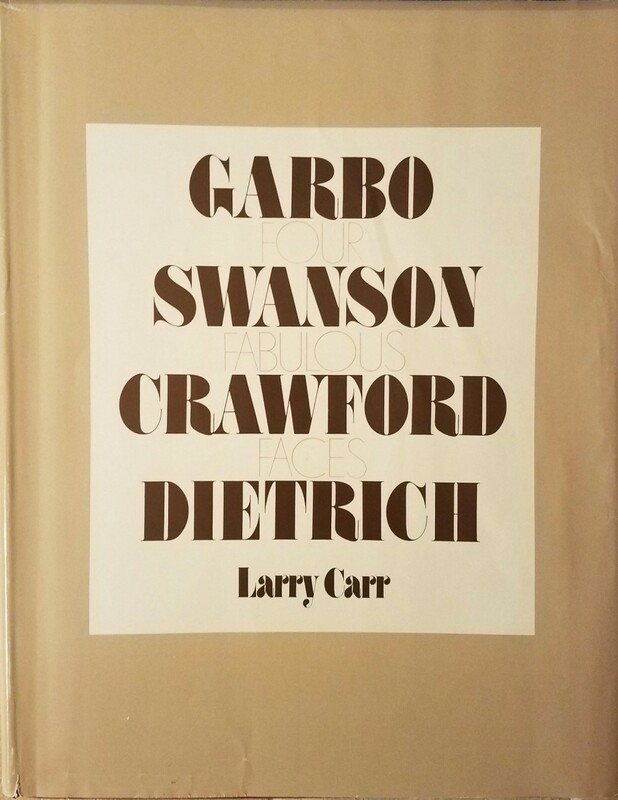 Larry Carr's large over-sized Four Fabulous Faces was published in 1970 by Arlington House and highlights the evolving faces of Greta Garbo, Gloria Swanson, Joan Crawford and Marlene Dietrich. 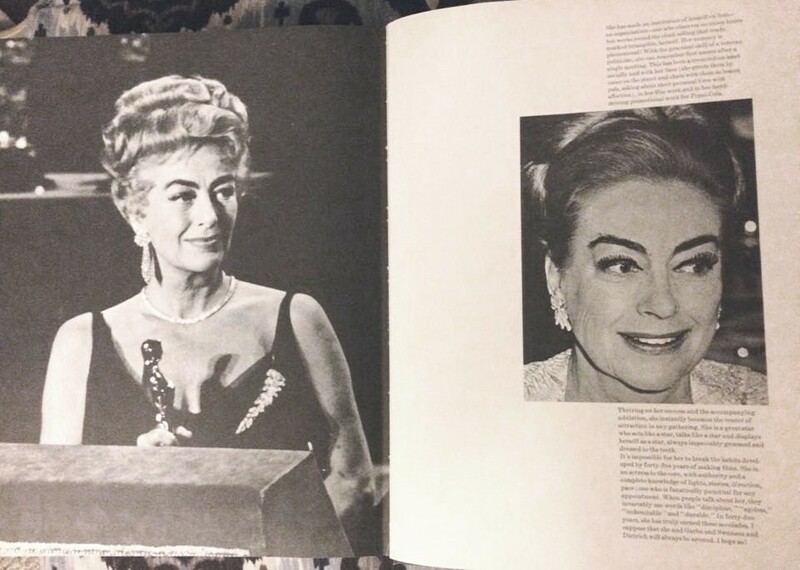 Among the many photos it exhibits of Joan Crawford, there is one which Joan despised. ​The photo was taken by U.K. newspaper photographer Michael Ward while on location during the filming of "Trog" in July 1969. The photo originally appeared in publication in the United Kingdom before being used in a New York Times article on August 24th, 1969. Later, it found it's way into Four Fabulous Faces, occupying a full page. 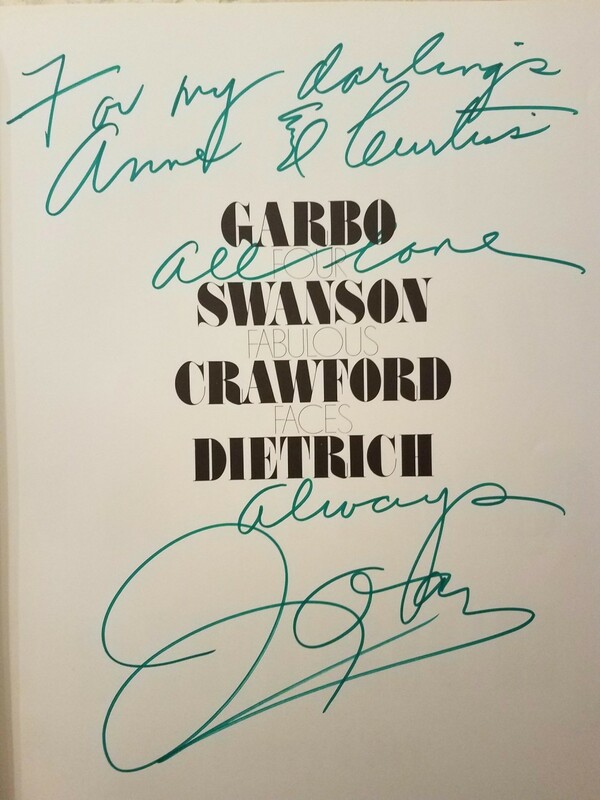 Joan detested the photo so much that she personally extracted the page ​from each copy of the book that she obtained before redistributing them to close friends, as documented in the 1979 biography "Crawford: The Last Years: by Carl Johnes. Below are exclusive photos of the copy given by Joan to her Imperial House neighbors, Anne and Curtis Anderson. This is one of my own copies of this book, and came from the Andersons. 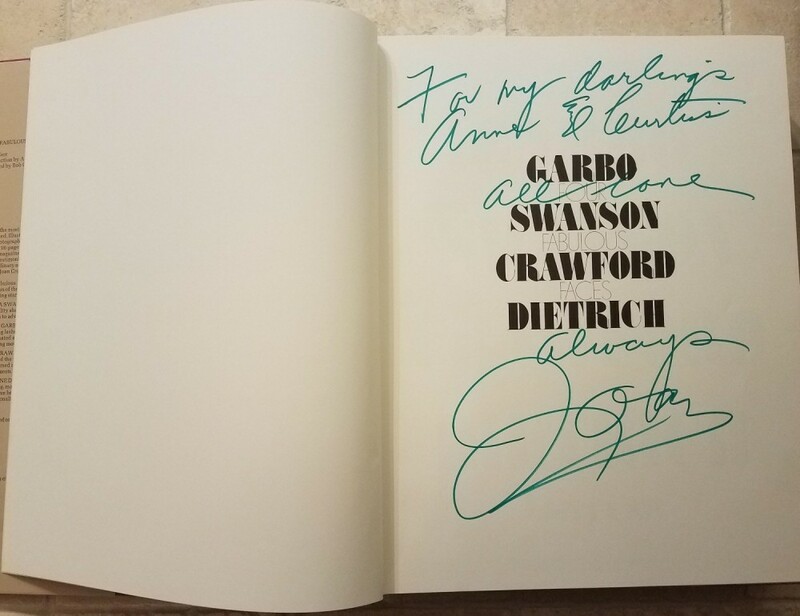 Also featured below are ​are excerpts from the book "Crawford: The last Years" and Bob Thomas' biography of Joan Crawford which further explain the photo and Joan's correlation with the Andersons. The August 24th, 1969 New York Times article featuring the photo (vertically flipped). Apparently Joan contacted the author or publisher following the book's initial publication. ​the ​1961 Academy Awards Ceremony in place of the 1969 photo.